I often blog about remodeling to make the bathroom safer for a senior who is not as mobile as they once were, but today I’m turning to another challenge that affects all seniors—aging eyes. What happens to aging eyes? First, the pupil gets smaller. 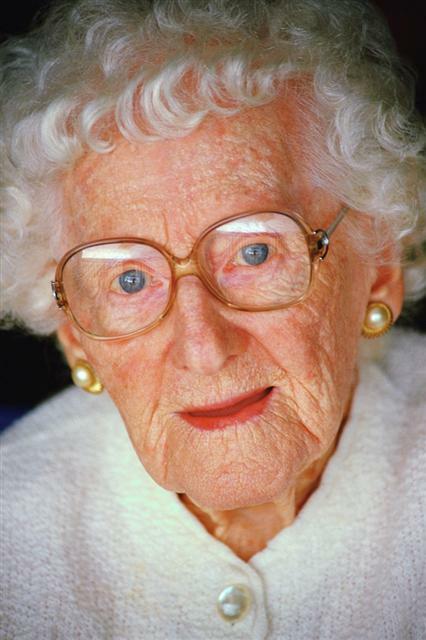 What does a smaller pupil mean to elderly people? If you put a 20-year old and an 80-year-old in the same sun-splashed room in the middle of the day, the youngster’s eye will receive six times the amount of light. It’s almost as if the senior is wearing sunglasses indoors. It gets worse. Now imagine the 20 year-old and 80-year-old person are up in the middle of the night navigating their way to the bathroom with little or no light. The young adult’s eyes are now receiving sixteen times as much light as the senior’s eyes. No wonder seniors lose their confidence about driving at night, and getting around the home can be equally tricky. Check out these pictures, on Marc Green’s, PHD’s website that, illustrate the problem. In addition, sensitivity to contrast fades, glare increases, and seniors perceive colors differently. Blue gets darker and purple gets redder. Many bathrooms are designed with a light over the mirror above the vanity. Remember when you were young and you played with a flashlight, placing it below your chin for a spooky effect? That’s essentially what the light is doing, to a lesser degree of course, when you place it above the mirror. It’s creating shadows. For evenly distributed lighting that minimizes shadows, place lights on both sides of the mirror and center them around eye level. Bonus: seniors will appreciate how it doesn’t accentuate their wrinkles! Select a vanity top in a light color that reflects light rather than absorbing it. Also, make sure it’s a matte finish so it doesn’t cause glare problems. Night lights, with or without motion sensors, should illuminate the path to and through the bathroom, helping seniors steer their course safely on late-night bathroom trips. Put the lights low, clearly marking the way. Seniors need task lights around the mirror, and above the shower and bath. Make sure that you use wet-location lights anywhere near water and keep them at least three feet from the water source. In addition, seniors need ambient lights so that lighting is evenly distributed around the bathroom. If there’s a window or a sky light, add as much natural light as you can without increasing glare. Fluorescent lights not only have lower energy requirements, they also are more diffused and so produce less glare than incandescent lights. What lighting challenges have you experienced with seniors in your care? Do you have any creative solutions to helping seniors who are visually impaired? Wonderful article. Many of these issues are also faced by younger people with vision problems as well. Also, but to a lesser degree, individuals who use wheelchairs and who are working from a lower level. Great ideas George! I'm sharing with my friends on FB, too. Great advice. I'm planning on helping my parents with their Austin bathroom remodeling and I definitely am going to take these factors into consideration now. Thanks!